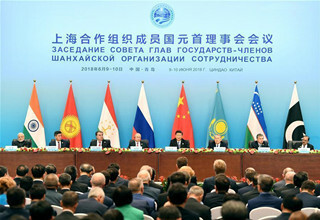 The 18th Shanghai Cooperation Organization (SCO) summit has injected fresh impetus to the building of an SCO community with a shared future and ushered in a new era for cooperation among member states. Leaders of Shanghai Cooperation Organization(SCO)member states issued a declaration on Sunday at annual summit held in China's coastal city of Qingdao.[Photo/VCG]. President Xi Jinping said on Sunday that broad consensus had been reached at the 18th Shanghai Cooperation Organization Summit as leaders endorsed the Qingdao Declaration and a joint statement on trade facilitation. Chinese President Xi Jinping chairs the 18th Meeting of the Council of Heads of Member States of the Shanghai Cooperation Organization(SCO)in Qingdao, east China's Shandong Province, June 10. Scholars and officials from around the world have been speaking highly of Chinese President Xi Jinping's keynote speech delivered Sunday at the Shanghai Cooperation Organization (SCO) summit in the eastern Chinese seaside city of Qingdao. Shanghai Cooperation Organization (SCO) member states should work closely to build an SCO community with a shared future, Chinese President Xi Jinping said on Sunday. With the forthcoming summit -- the first after a membership expansion to include India and Pakistan last year, the SCO is set to play a more influential and substantial role in promoting regional security, peace and prosperity. China will push for the establishment of an anti-drug agency within the Shanghai Cooperation Organization to better fight cross-border trafficking, a senior anti-narcotics official with the Ministry of Public Security said. The upcoming 18th summit of the Shanghai Cooperation Organization (SCO) in the eastern Chinese city of Qingdao has come under the global spotlight as it carries special significance. Chinese President Xi Jinping will chair the 18th Shanghai Cooperation Organization (SCO) Summit, which is scheduled for June 9 to 10 in Qingdao, a coastal city in east China's Shandong Province. The Shanghai Cooperation Organization (SCO) will hold a summit in June as leaders are expected to exchange ideas on dealing with global issues and roll out cooperation measures for the bloc's future when they gather in east China's coastal city of Qingdao.